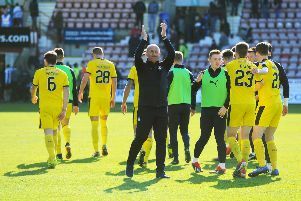 Peter Houston threw on two ex-Dundee United players against the Tangerines and it was enough to tip the balance of an enjoyable game in Falkirk’s favour. The Bairns had performed well against Ray McKinnon’s side, and the match was finely poised at 1-1 when the Bairns manager made his three changes – John Rankin, Lee Miller and James Craigen on for Craig Sibbald, Bob McHugh and Tom Taiwo – at various points throughout the second half. And with the re-inforcements on the park the Bairns turned a 1-1 draw into a 3-1 victory with two typically late strikes from Myles Hippolyte and Miller. Boss Peter Houston said: “Substitutions were crucial [against Dundee United]. When I look at my bench and I’ve got John Rankin, Lee Miller and James Craigen to bring on – and that’s with a guy like Paul Watson not getting on – I know we’ve got strength in depth. As pleased as Houston was, he felt his side was denied a penalty in the first half when goalkeeper Cammy Bell brought McHugh down in the box. Ref Crawford Allan waved away the claims from the navy blue clad players, but it was alright in the end. Lee Miller celebrates his goal with James Craigen. Picture by Michael Gillen. “We got our just rewards to win the match – we should also have had a stonewall penalty kick. But it wasn’t given and we didn’t let that affect us and kept battling away,” added Houston, who has now seen his side win three league games in a row, conceding just once after a poor start to the season. “We have spoken about getting back to doing what we’re good at and what brought us some success last season. Read David Oliver’s match report here. Vote for your Starshot man of the match here.